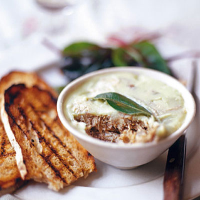 Rillettes make a change from pâté and are delicious spread on toasted rye bread with a little salad on the side. You can make them in advance as they’ll keep for a week under a thin layer of fat. Preheat the oven to 130°C, gas mark ½. Place the belly in a large casserole dish with the other rillettes ingredients and mix well. Cover with a tight lid and cook for 3½–4 hours until the pork is soft and surrounded by melted fat. Pour off the juices through a sieve into a measuring jug. Put this in the fridge or freezer for 15–30 minutes, to let the fat rise and set. Remove the fat and transfer to a small pan. Shred the meat with two forks and mix with 4–6 tbsp juices from the jug, to make it moist. Check the seasoning, then pack into 6–8, 100ml bowls or a 900ml terrine. Warm the pork fat over a low heat until melted and pour just enough on top of the terrine to create a thin seal. Garnish with a few bay leaves. Set in the fridge for 24 hours. To make the salad dressing, place the mustard in a bowl; add the vinegar, salt and pepper. Whisk in the oil until emulsified, then add the gherkins. Dress the salad and toast the bread. Serve with the rillettes.